A report by Sri Manmeet Singh Gill carried in the Tribune. Photo: In his right hand is the (Dhurpadi) Rababa handcrafted by Bhai Baldeep Singh based on the 16th century Rabab of Guru Arjan Dev, the fifth Sikh Guru, while his handcrafted Saranda, in his left hand, is believed to have been originally designed by Guru Amar Das, the third Sikh Guru. 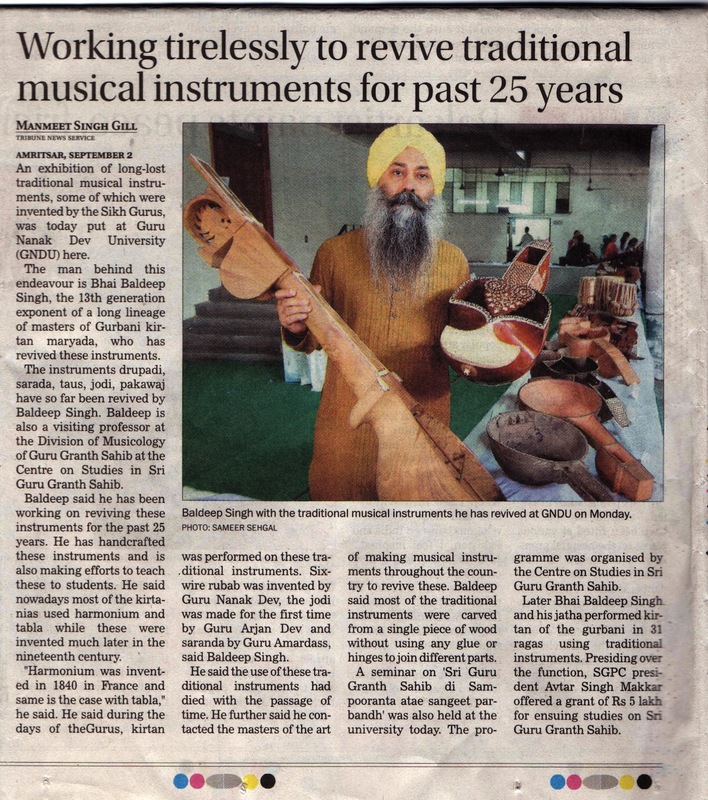 Misquote: Column 2 & 3 – it seems from the text that Bhai Baldeep went around in the country getting the instruments made. Untrue. he did go around the country to some of the biggest names trying to “convince” them to make the original instruments but they all eventually “confessed” that they had never learnt how to make them. In the winter of 1991-2, he discovered his grandfather, Gyani Bhagat Singh’s youngest classmate Gyani Harbhajan Singh Mistri who was the last remaining luthier with the original knowledge. He studied under him and made the instruments, apprenticing under him, from 1992 – 1996. Very nice article. Many congratulations for all the good work you have done in the field of music. I do hope to see you perform live one day. Waheguruji kirpa karan, keep up the good work.